The Nagoya Hotel, with its distinct onion dome, in Nagoya City, Aichi Prefecture, Japan. 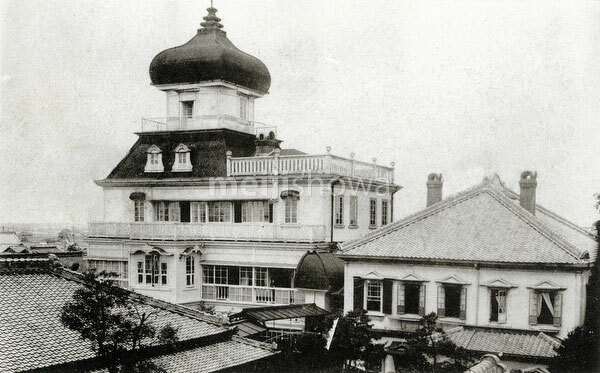 The hotel, for many years the only accommodation for foreign visitors in the city, was opened in 1895 (Meiji 28) and located at 80 Katamitsukura-machi (竪三蔵町80). In 1907 (Meiji 40) it ceased business operations, but in 1919 (Taisho 8) it was bought by the Osaka Hotel. The hotel was burned down during WWII. The 5 story wooden structure featured a unique mix of Western and Japanese architectural styles. The architect apparently reached too high; for safety reasons the tower had to be removed in 1920 (Taisho 10). The hotel played an important role in Japanese food culture. The tomato sauce and ketchup it served caught the attention of Ichitaro Kanie (蟹江一太郎, 1875-1971), who in 1899 (Meiji 32 ) was the first person to grow tomatoes in Japan. Kanie researched how the two products were made. In 1903 (Meiji 36), he started mass production of tomato sauce (currently tomato puree). Ketchup followed 5 years later. His company, Kagome, is now Japan’s largest manufacturer and distributor of tomato-based foods.